Following the Guatemalan Civil War in 1996, the national government placed increased priority on improving access to education in rural areas through an education decentralization program entitled PRONADE. PRONADE was established to further develop the country and minimize inequalities between its wealthiest and poorest citizens. While PRONADE has been viewed as successful in increasing access to education in rural communities — particularly due to the number of schools it is able to support — scholars have raised questions about its success in increasing quality of education. I posit that while PRONADE is successful in improving access to education, it fails in various other areas because rural education committees still lack the power to develop the educational system necessary to support their communities. In this sense, I argue PRONADE is not a total success particularly because of funding issues, scheduling, teacher turnover and the community impact of a PRONADE school. In 1992, the Guatemalan government launched the Programa Nacional de Autogestión para el Desarrollo Educativo (PRONADE) in order to study the most rural communities of the nation and devise strategies on how to improve various social factors, including education. Following the 1996 post-civil war transformation of the government, PRONADE was placed under the Ministry of Education and made to solely focus on improving access to education in Guatemalan rural communities through the opening of new decentralized, community-run schools (U.S. Agency for International Development 2007, 1). In the time between 1996 and 2006, PRONADE grew at a rapid pace starting with just 477 schools and today having more than 4,600 (U.S. Agency for International Development 2007, 3), partially with the financial support of the World Bank and KfW, the German state development bank (U.S. Agency for International Development 2007, 6). While education metrics have generally improved at the same time as the rise in access to education, Guatemala still remains the least educated Spanish-speaking country and the second least educated country in the Western Hemisphere (United Nations Development Programme 2011). Yet, while education has been increasing according to the United Nations Development Programme (UNDP) Education Index, Guatemala’s Human Development Index (HDI) growth has remained rather stagnant versus the medium human development countries and countries within the Latin American region. This could be largely attributed to its lowest metric, the Education Index, which keeps Guatemala’s HDI from growing at the standard rate (United Nations Development Programme n.d.). These data points beg the question; to what extent does increased access to education improve education, and even, human development overall? Is PRONADE actually beneficial to improving Guatemalan education or does the program have more of an effect on globally recognized metrics such as HDI and just part of an attempt to incorporate larger reforms within Guatemala? As several scholars point out, there may be many publicly unrecognized consequences by key international institutions of the widespread decentralization of the Guatemalan educational system in rural communities, such as poor teacher quality. Why Does Education Matter for Development Overall? Understanding education disparities is key to understanding development within a country. Poverty can be viewed using a capability approach instead of purely considering economic measurements. This means that various ‘unfreedoms’ can lead to poverty (Sen 1999). Amartya Sen (1999) specifically recognizes five fundamental types of freedom that play a key role in pulling individuals out of poverty. One of these types of freedom, “social opportunities” (10), would include access to an education, especially, in concurrence with the Millennium Development Goals at the primary level. These freedoms, such as access to education, are important because they create a feedback loop of sorts. According to Sen (1999), freedom improves quality of life and leads to the most beneficial social arrangements, which then lead to even more freedoms (31). Following in Sen’s theories, reducing the disparity in access to education has the potential to spur additional development and pull more people out of poverty. Some authors, particularly those affiliated with international institutions, point to the successes of PRONADE and don’t view the program with much of a critical lens. The United States Agency for International Development (2007) generally views PRONADE very favorably in expanding access to education in post-war Guatemala. Altschuler and Corrales (n.d.) also take note of the benefits offered by the program but focus instead on how the program affects society at large participating in the democratic state, perhaps alluding to an ulterior motive such as programs like PRONADE and its counterparts abroad. Several authors, while recognizing some improvements with the implementation of PRONADE, note serious concerns. For example, Marshall (2009) demonstrates that while the program led to some improvements in access, teacher capacity and student achievement remains largely limited when compared to other types of schools. Gershburg et al. (2009) specifically compare the reforms of PRONADE to those of the Programa de Desarrollo de la Educación Escolar, a different decentralization and reform program intended for already existing schools, and notes that a sort of hierarchy often exists between schools with PRONADE on the bottom. According to research by Grindle (2004, 10), it is unclear how far the program has progressed in implementing its goals, especially in comparison to other Latin American countries. While there exist several benefits to the increased access to education provided through programs like PRONADE, several authors such as Gershburg et al. and Marshall remain critical. They note that other factors may be playing a role within the functioning of educational institutions created by the program that may also continue to perpetuate high levels of inequality within Guatemala, particularly between rural and urban dwellers and the indigenous and non-indigenous populations. These factors play a crucial role in understanding the success of Guatemala’s education reform, or lack thereof. Neoliberals can view PRONADE as empowering communities in ways never done before the implementation of the program. PRONADE schools are run by Education Committees (COEDUCAs) which function in ways similar to the American school board. COEDUCAs are funded by MINEDUC to run PRONADE schools chartered to them and handle human resources, finance, procurement, dining services and materials and libraries that may exist at the school site (World Bank 2005, 2). Yet, there may be instances where funding from MINEDUC may not be enough for the school. In the PRONADE cases studied by Gershberg et al. (2009, 199), the schools charged each sending family a facility fee for school construction, in addition to time and energy, while non-PRONADE schools in rural areas did not require any additional funding. MINEDUC also only spends six dollars per student for school materials within PRONADE schools (World Bank 2005, 3). As a result, materials within PRONADE schools are severely inadequate. For example, it is estimated that as recently as 2008, 31 percent of students did not have a proper desk (Otto 2008, 17). Various neoliberal reforms in education have not changed the fact that school fees may be required of parents in developing countries. In fact, it took Guatemala until 2008 to eliminate school fees entirely, much later than the introduction of the reforms of PRONADE that were designed to improve access to education (Guatemala Declaration 2008, 2). Yet, the fact that the revenue stream to schools has been significantly cut off and students are still not sitting at desks is rather concerning about the ability of PRONADE to provide a beneficial program that not just reforms access but quality as well. The powers of COEDUCAs are also greatly limited in their ability to schedule the school year to reflect the needs of the local community. According to the World Bank (2005, 4), PRONADE schools also offer, on average, twelve additional days of instruction versus non-PRONADE schools but this measurement fails to take into account the lack of flexibility allowed to the COEDUCA by MINEDUC, so students in PRONADE schools often miss a month or more of schooling to attend to the agricultural needs of the community (Gershberg et al. 2009, 197). As Guatemala’s rural areas grow a number of labor-intensive crops including bananas, coffee, and sugarcane (Central Intelligence Agency 2012), communities would be economically impacted if they did not allow youth to participate in the harvest season. Neoliberals may celebrate some victories with the creation of COEDUCAs, however, as the COEDUCAs have limited abilities to make decisions (such as those regarding the school calendar) and are not adequately able to fund themselves. Thus, the empowerment of the community is radically limited and the full potential of the COEDUCA is not realized. The greatest problem arises not out of the struggles of the COEDUCAs to get children to school, but rather the effect that PRONADE has on teachers. While there exist several thousand schools today throughout Guatemala that did not exist ten or fifteen years ago, the actual quality of education in the newly founded schools leaves much to be desired when compared to their counterparts within the country. For example, teacher capacity and quality within PRONADE schools is greatly limited by teacher salary, and as with the issues of the school calendar, COEDUCAs are in no position to make beneficial changes. As of 2008, while the PRONADE salary was larger than that of PROESCOLAR, PRONADE provides no possibility of upward mobility in earnings, requires teachers to purchase their own health insurance and bars teachers from paying into the state social security system. PRONADE teachers also have no possibility for tenure and must renew their contract every year. A PROESCOLAR teacher at the top of the salary range will earn more than double his counterpart in a PRONADE school with the same level of experience (Gershberg et al. 2009, 192). In fact, teacher turnover is so high within the PRONADE schools, that the schools themselves have been equated to a “teacher training program” (Gershberg et al. 2009, 197) because teachers from underserved communities use PRONADE to gain experience necessary to gain employment in government-run schools. This salary inequality arises from structural differences between the systems in how MINEDUC determines salary for teachers. The inequality largely contradicts the views of the World Bank, which has claimed that Guatemalan rural communities are some of the most empowered in the world to administer their own schools — because while the communities have the ability to deal with the teacher hiring and firing, they do not have the power to pay them above the fixed salary (Gershberg et al. 2009, 188). PRONADE schools also benefit from having the ability to choose teachers, which places some possibility of improving education within their own hands by hiring teachers from within their ethnic community. Studies have shown that education by indigenous teachers is most beneficial in indigenous communities. For example, Marshall (2011, 1454) demonstrates that indigenous students taught by teachers from the indigenous community are less likely to drop out of school while he earlier demonstrated that having indigenous teachers and utilizing bilingual education lead to higher student achievement (Marshall 2009, 212). A key advantage of PRONADE is that COEDUCAs are empowered to hire indigenous teachers while hiring decisions at all other schools, including at the reformed PROESCOLAR sites, are left entirely to MINEDUC and its various regional offices (Gershberg et al. 2009, 193). 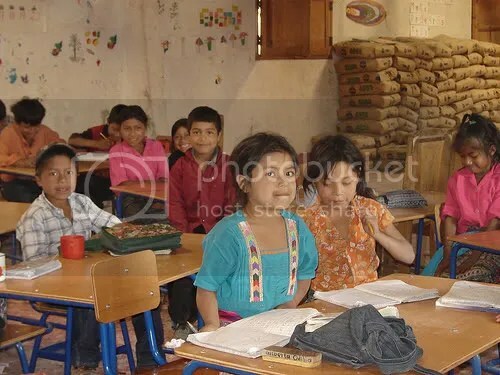 Yet, while indigenous teachers can serve in the PRONADE classroom quite easily and make up the majority of PRONADE teachers (Maxwell 2009, 93), the curriculum that they are supposed to teach is poorly developed to address the needs of Mayan communities and could even be construed as insulting to indigenous Guatemalans. For example, when numbers are taught in the Mayan languages, instead of using the actual number used in the indigenous language, teachers are instructed to use an imperfect translation from Spanish back into the indigenous language (Maxwell 2009, 90). Lessons like this make one question the effectiveness of the curriculum itself. If math must be taught in such a fashion, why not teach it using both Spanish and the Mayan language using the correct terminology? Education has greater effects on Mayan culture and society than meets the eye. One also needs to question the benefits of a decentralized system, such as PRONADE, on the structure of the community as a whole. Some benefits might possibly arise from the implementation of COEDUCAs overseeing PRONADE schools by creating spillovers from the participatory governance system of the COEDUCA into other aspects of civil society. Yet the same optimistic authors note that the creation of PRONADE schools may actually break communities up by leading to such rapid growth of civil society and the necessity to divide communities to make the case for a community-managed school that best suits a community’s need (Altschuler and Corrales n.d., 22-3). This is important because PRONADE schools cannot be within three kilometers of any other school (World Bank 2005, 2), so essentially the first community in close proximity to another will win out in obtaining a school. In this sense, PRONADE affects more than the children of the immediate community, but rather has the capability to transform the entire community, including adults. When efforts to obtain a charter do succeed, parental involvement is a necessary condition for the success of the PRONADE (and even PROESCOLAR) schools. Similar to the students’ competing time demands that lead to their absenteeism during the harvest season, adults are also hard-pressed to find time to help run the PRONADE schools. Parents must choose between the tradeoff of taking time off work and receiving no pay for serving on the COEDUCA or delegating administrative tasks to the teachers. Often, COEDUCAs will require teachers to fulfill administrative tasks related to the operation of not just the school, but also the COEDUCA as a condition of employment (Gershberg et al. 2009, 195). This decision by the community leaders has a further impact on teacher capacity and ability to obtain an education for their children. Recent studies on the effects of decentralization of education have largely demonstrated that while more and more students have access to education within Guatemala, there still exists much room for improvement within the system to increase the quality of instruction. Various structural changes to the PRONADE system and the powers of the COEDUCAs, such as the ability to allow teacher upward mobility, would be required in order to implement additional quality and teacher capacity improvements. These changes will truly empower the communities in the ways that the program creators envisioned and will prevent issues such as high teacher turnover and low attendance that continue to plague PRONADE schools. This conclusion is not meant to declare the entire PRONADE program a failure. In fact, the program is far from that. Rather, the benefits and consequences of PRONADE on the education of rural indigenous youth and the resulting transformation of communities housing PRONADE schools must be realized. As benefits do seem to arise from the implementation of PRONADE, more research must be done over time, especially for the long term. For PRONADE to be considered effective in improving the education access in Guatemala as a whole, eventually the expected years of schooling must converge upon the mean years of schooling. Not enough time has passed to see if this will occur, but Guatemala moves closer to this convergence each year. Altschuler, Daniel and Javier Corrales. N.d. “The Spillover Effects of Participatory Governance: Evidence From Community-Managed Schools in Honduras and Guatemala.” Comparative Political Studies. Forthcoming. Gershberg, Alec Ian, Ben Meade, and Sven Andersson. 2009. “Providing better education services to the poor: Accountability and context in the case of Guatemalan decentralization.” International Journal of Education Development 29 (May): 187-200. Grindle, Merilee S. 2004. Despite the Odds: The Contentious Politics of Education Reform. Princeton, NJ: Princeton University Press. Guatemala Declaration. 2008. Latin American Campaign for the Right to Education. http://www.campanaderechoeducacion.org/download.php?s=publications&i=42 (February 27, 2012). Marshall, Jeffery H. 2009. “School quality and learning gains in rural Guatemala.” Economics of Education Review 28 (April): 207-216. Marshall, Jeffery H. 2011. “School quality signals and attendance in rural Guatemala.” Economics of Education Review 30 (December): 1445–1455. Maxwell, Judith M. 2009. “Bilingual Bicultural Education: Best Intentions across a Cultural Divide.” In Mayas in Postwar Guatemala: Harvest of Violence Revisited, ed. Walter E. Little and Timothy J. Smith. Tuscaloosa, AL: The University of Alabama Press. Otto, Nina. 2008. “Analysis of the Guatemalan Education Sector from a Human Rights-Based Perspective.” GTZ. http://www.institut-fuer-menschenrechte.de/uploads/tx_commerce/mission_report_analysis_of_guatemalan_education_sector.pdf (February 27, 2012). Sen, Amartya. 1999. Development as Freedom. New York, NY: Anchor Books. United Nations Development Programme. 2011. Education index (expected and mean years of schooling). http://hdrstats.undp.org/en/indicators/103706.html (February 26, 2012). United Nations Development Programme. N.d. Guatemala Country Profile: Human Development Indicators. http://hdrstats.undp.org/en/countries/profiles/GTM.html (February 26, 2012). United States Agency for International Development. EQUIP2: Educational Policy, Systems Development, and Management. 2007. Meeting EFA: Guatemala PRONADE. http://www.equip123.net/docs/e2-MeetingEFAGuatemalaCaseStudy_WP.pdfFile (February 13, 2012). World Bank, The. 2005. Decentralizing Education in Guatemala: School Management by Local Communities. http://siteresources.worldbank.org/EDUCATION/Resources/Education-Notes/EduNotes_Guatemala.pdf (February 13, 2012).